Susan Thixton researches most cat food brands, including Orijen. She rates the brands and their individual varieties of cat food, based on ingredient quality, safety and more. The reviews are only available to subscribers, however. Orijen earns a 5-star rating here. The editors say that only the best, freshest ingredients are used, and that the company makes the food in its own plant, giving it complete control of the process. Reviews.com analyzes cat food ingredients to find top choices, then winnows foods further using strict criteria that looks for issues with controversial ingredients, past safety issues, and questionable manufacturing or ingredient sourcing. 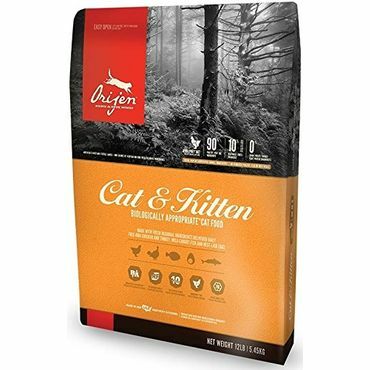 Orijen dry cat foods, including the Cat and Kitten formula, clear those hurdles to be included among the site's recommendations. Orijen Cat and Kitten earns a very strong 4.7-star rating here, with more than 750 reviews posted. A few owners say their cats don't like it, but most say their cats gobble it up -- and rave about their cats' health as a result. Around 94 percent say they recommend the food. There are just less than 60 reviews of this flavor of Orijen at Amazon.com. A few complain that the food is now made in the U.S. instead of Canada, and about a formula change, but most are pleased and the food earns 4 stars overall.